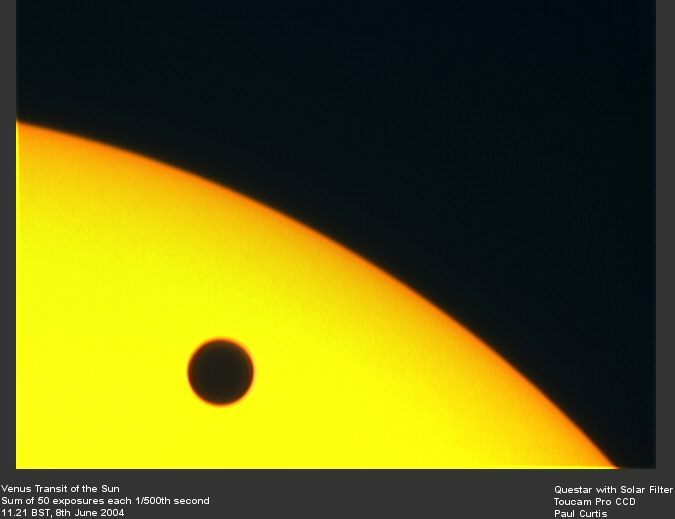 On 5/6th June 2012 Venus passed in front of the Sun. 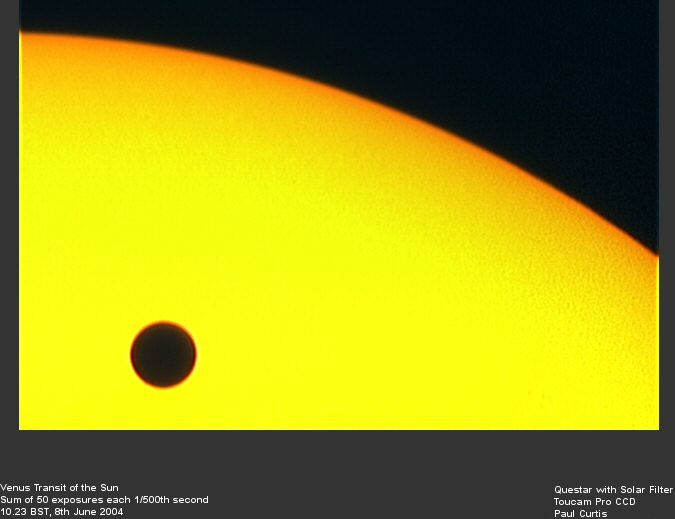 Only the last part of the event was visible in the UK as the Sun rose on the morning of 6th June. 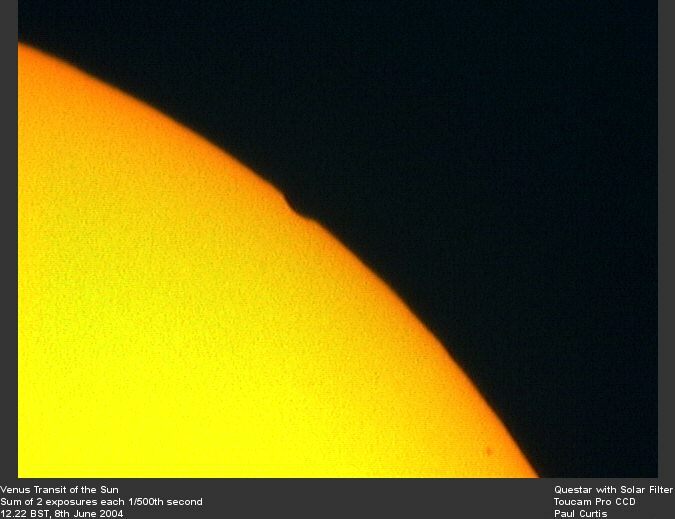 I observed the event from Westport, CT in the USA, watching the start of the event which happened for just over 2 hours before the sun set on 5th June. 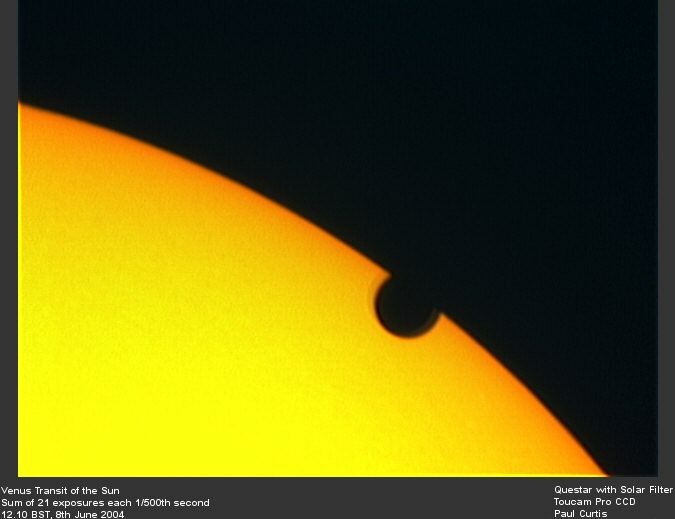 Sadly the weather didn't match up to that of the 2004 transit (see below) and it rained for the first hour, from 18:00-19:00 EST. 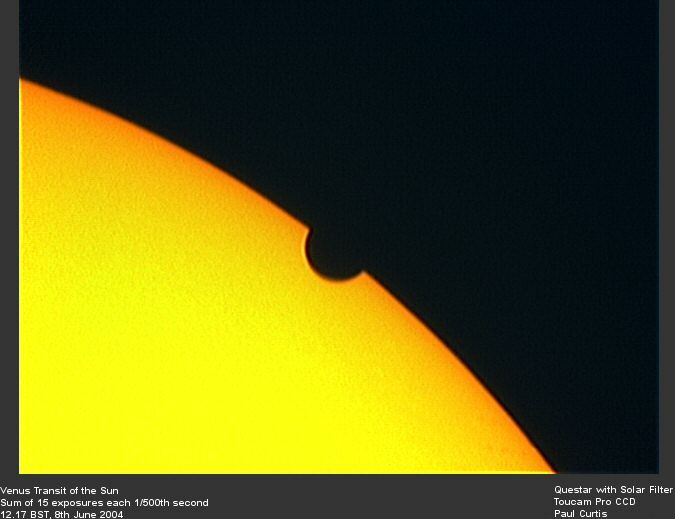 But shortly afterwards some holes appeared in the clouds and I managed to get a view of the transit. 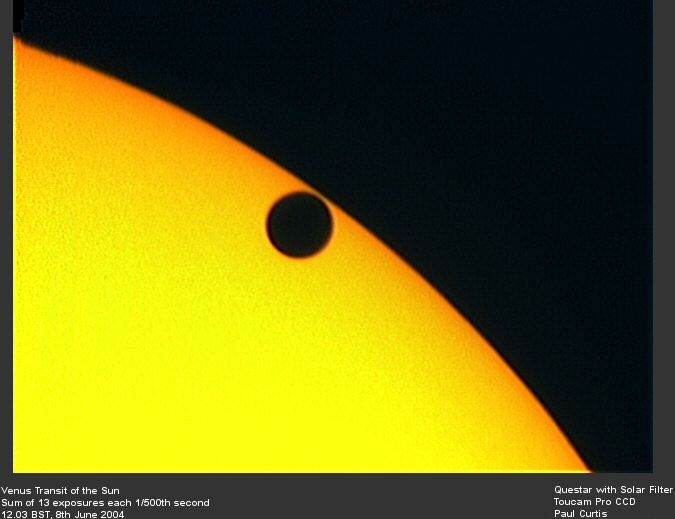 On 8th June 2004 Venus passed in front of the Sun. 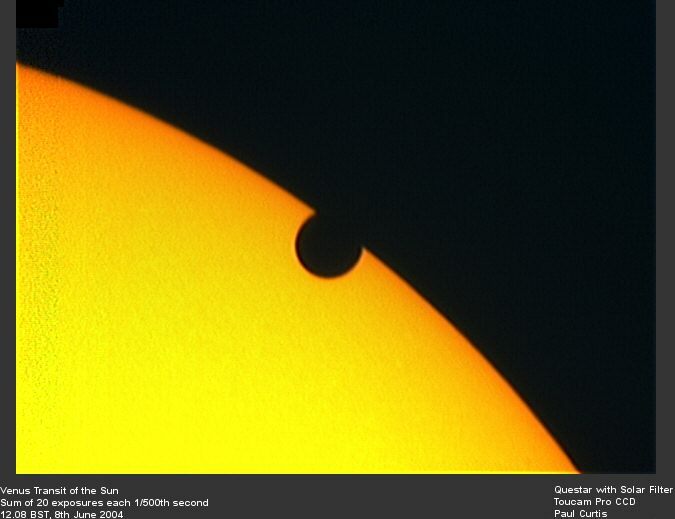 The event started early soon after 6am but I started observing around 7.50am (BST). 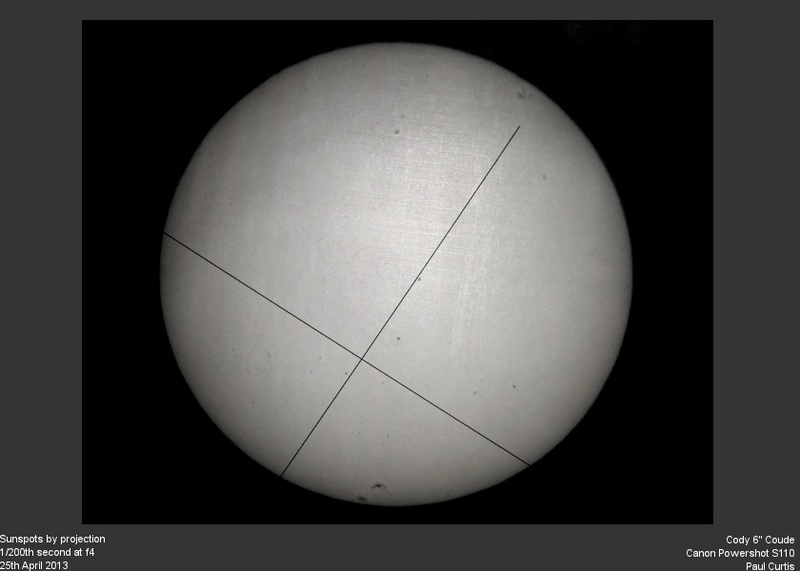 I went to the Cody Astronomy Society at Farnborough and had views through the Society's 6" Zeiss Coude which were superb. 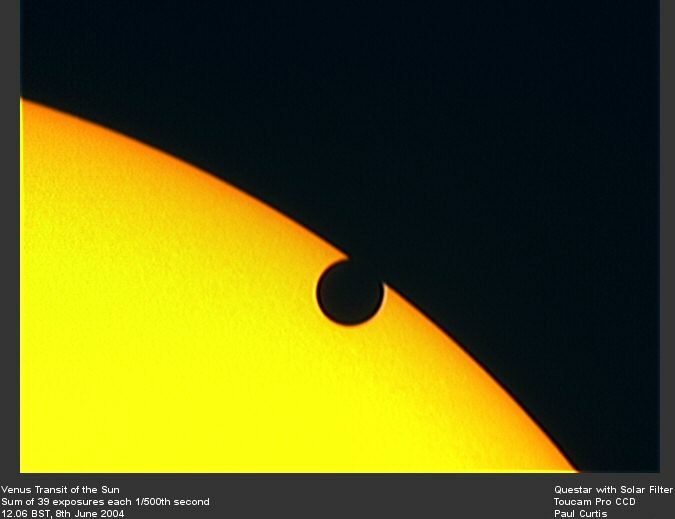 The weather was amazing, hot and sunny and up to 31C by the end. 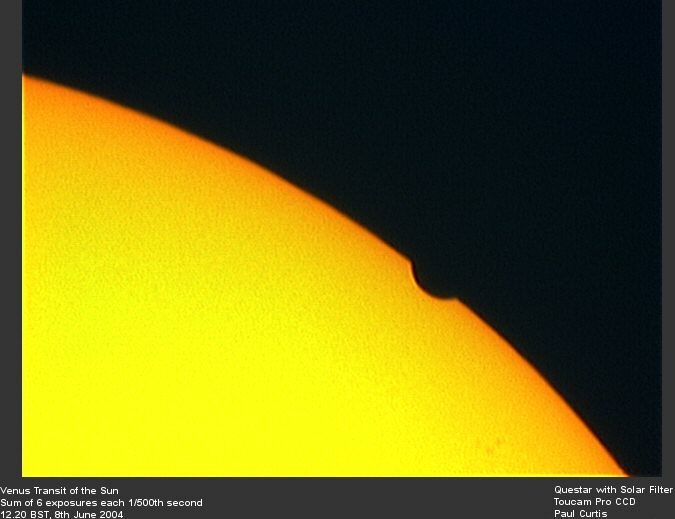 Most of the photos below were taken using a 4" Questar stopped down to about 40mm with a solar filter. The camera for this was a Phillips Toucam Pro Webcam with an IR/UV filter attached. 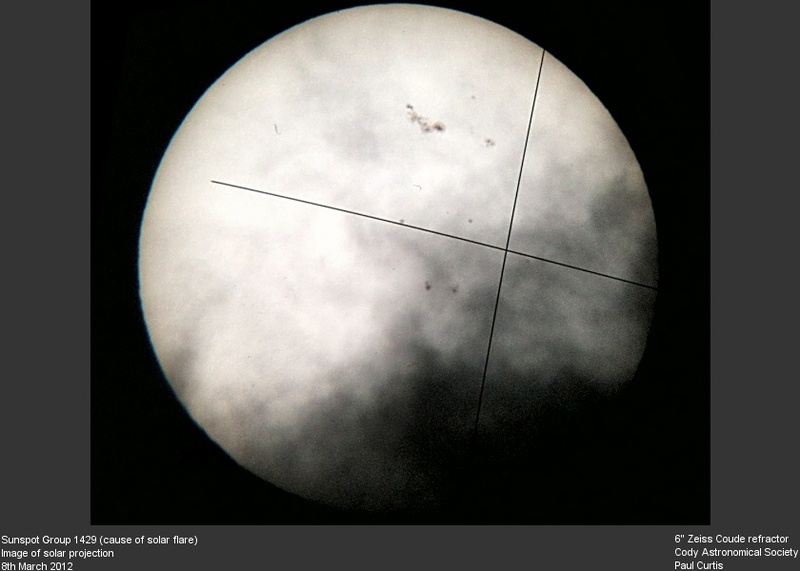 Third contact was at 12.04 and clearly seen and indeed captured in the images below. 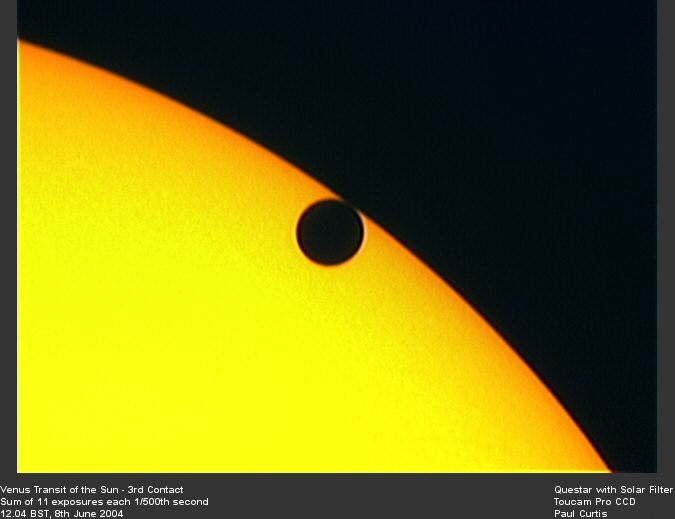 Fourth contact was at 12.24 and an image at 12.23 shows the final sign of Venus at the limb of the Sun. Here's a photo of me with the questar and laptop in action (courtesy of David Whitehouse). 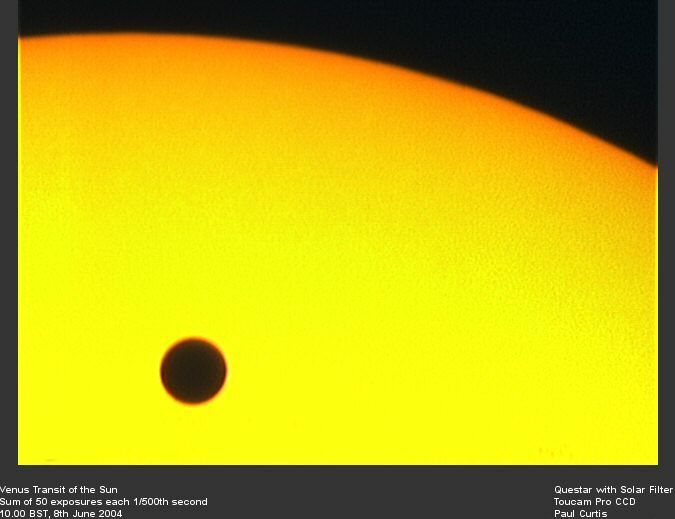 Mercury transit of the sun, 7th May 2003, Questar 'scope with solar filter, Philips TouCam Pro Webcam. 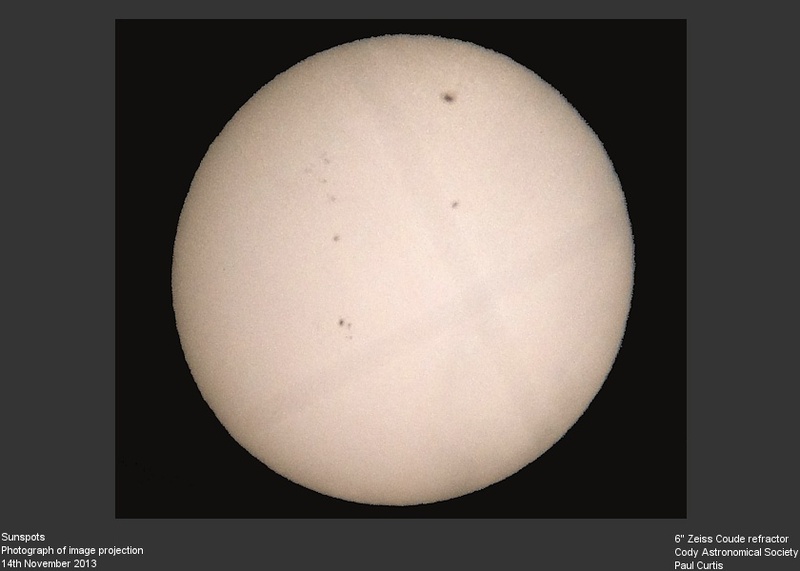 Sum of 20 x 1/250 second exposures, processed in Registax. 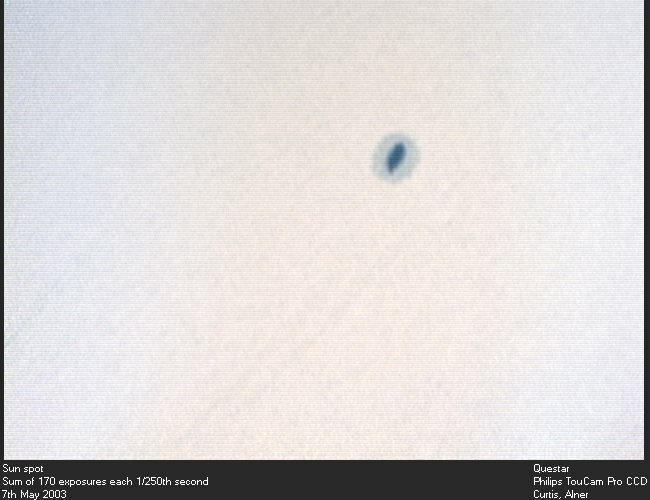 Sunspot during the Mercury transit of the sun, 7th May 2003, Questar 'scope with solar filter, Philips TouCam Pro Webcam. 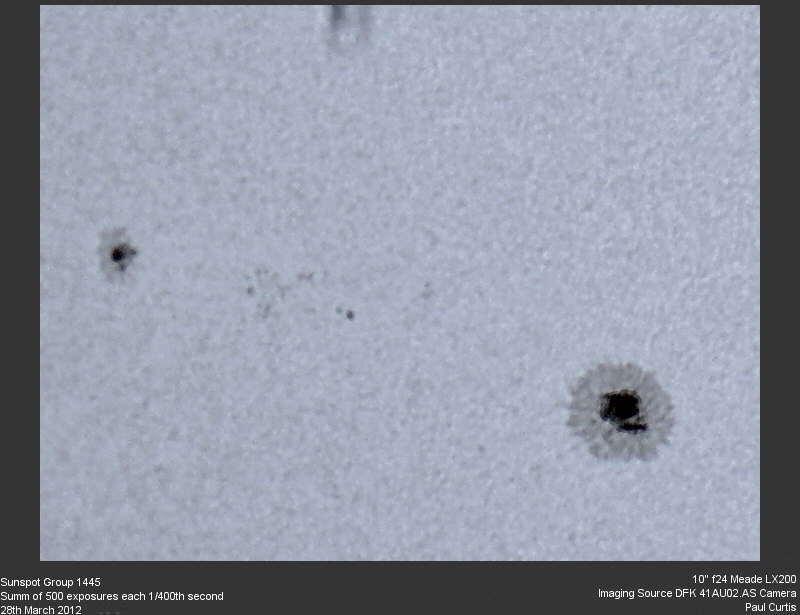 Sum of 170 x 1/250 second exposures, processed in Registax. I was fortunate to be one of the few in Northern Europe to view the solar eclipse on 11th August from a clear cloudless sky. 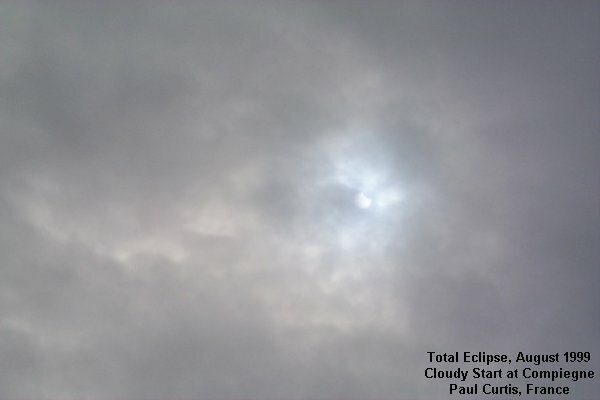 Staying near Compiegne in France, close to the centre line of the eclipse I hoped for an excellent view, but like many in Europe, woke to find cloudy skies with only glimpses of the sun through less dense parts of the cloud. With just 40 minutes to go to totality it looked like I would see little, but over to the west an area of blue sky appeared, but it was clearly not going to reach me in time. So my family and I jumped into our car and raced off through the French countryside, chasing the gap in the clouds. Luckily we made it with just under 15 minutes to go - we found ourselves close to a small village called Avenchy on a minor road crossing some fields, together with a few other enterprising French people who like us had chased the eclipse. 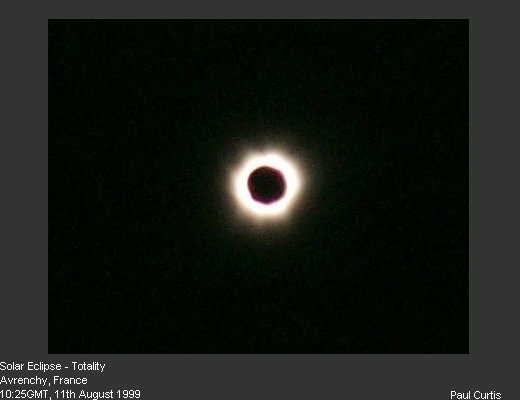 We watched in awe as we saw the diamond ring, the moon's shadow approaching rapidly from the west, a dog barking and then darkness and that amazing view of the corona, only visible at totality. 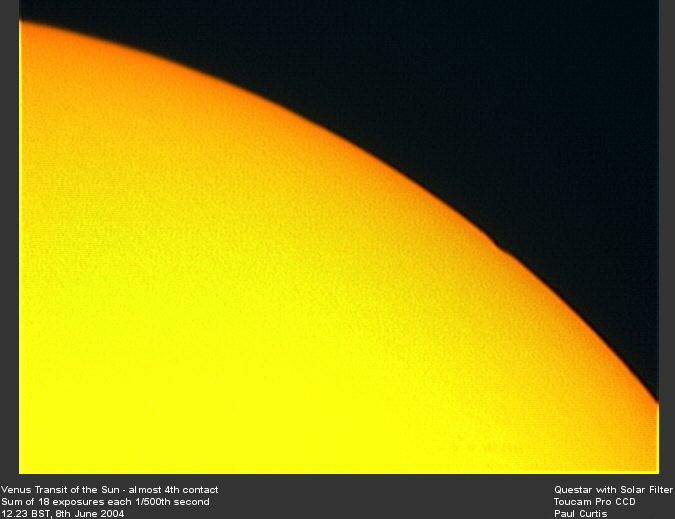 The corona seemed very uniform, although two large prominences were visible either side of 6 o'clock on the sun's disk. 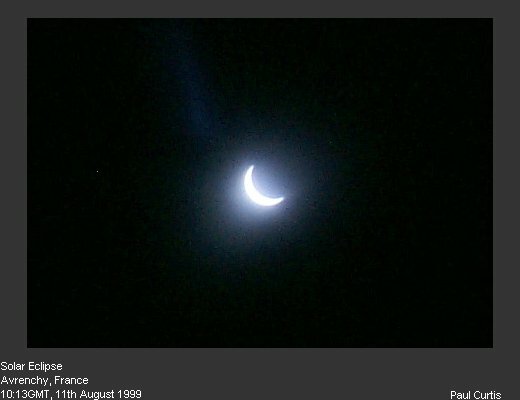 The two minutes passed far too quickly, it seemed like a few seconds, then the moon's shadow was racing to the East, the diamond ring appeared and then the crescent sun and the whole process manifested in reverse. It was truly an amazing site. I took only a few pictures as I was determined not to spoil the visual experience. 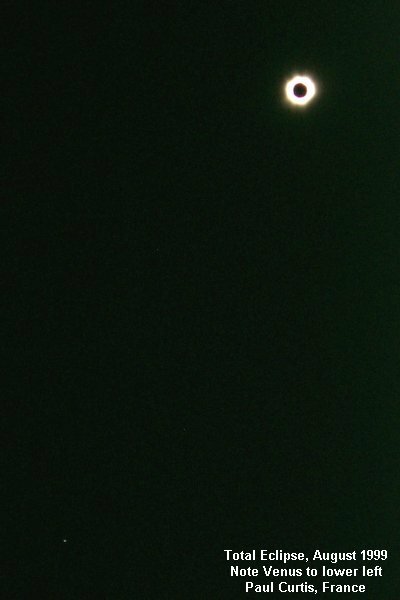 I used a conventional Kodak digital camera to take a few pictures, two of which appear below. 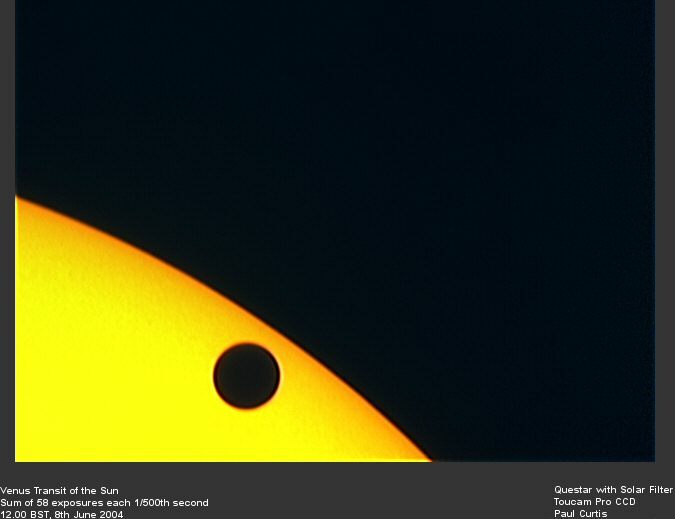 I also took some video footage, which is a good record of the event, but like most conventional video cameras I was unable to vary the exposure and much of the recording is somewhat overexposed. 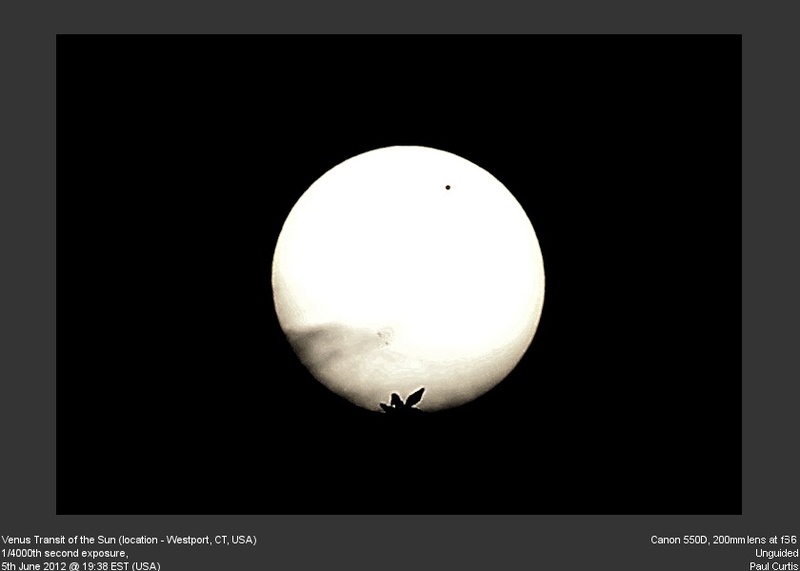 However, I hope to get some captured frames on this site soon. 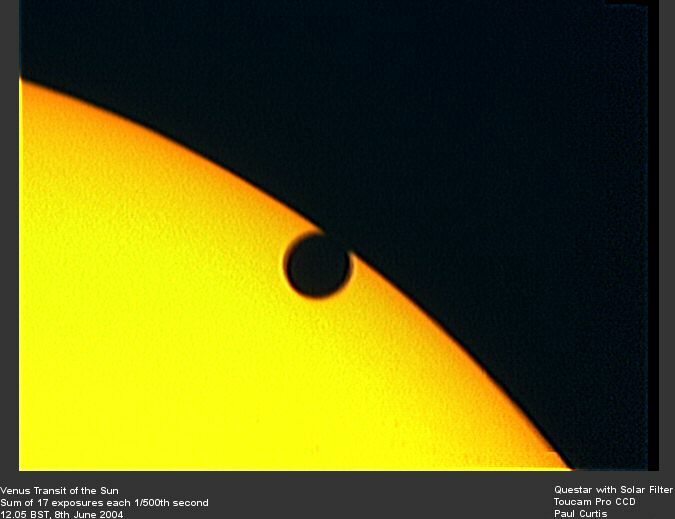 For now I hope the pictures below give an impression of the event.